Pub rock is one of the lesser remembered music genres that really only existed in the London area and occasionally spilt over into Essex. It happened in the early/mid seventies and included bands like Kilburn & the High Roads (who later became Ian Dury & the Blockheads), Ducks Deluxe, Bees Make Honey, Brinsley Schwartz and Dr Feelgood. 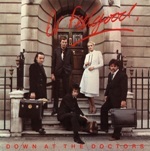 Dr Feelgood was formed in 1971 and came from Canvey Island. The original line up comprised vocalist Lee Brilleaux, Wilko Johnson on guitar and John B. Sparks on bass but soon brought in John Martin on drums. It is often said that they took their name from the B-side of Johnny Kidd & The Pirates minor hit Always and Ever which was called Dr Feelgood, but in actual fact they took it from the original version of the song which was by the American blues pianist and singer Willie Perryman who recorded it as Dr. Feelgood & The Interns. Their first UK hit was the Wilko-penned Sneakin’ Suspicion which limped to number 47. The follow-up, She’s A Wind Up, which was written by Brilleaux and Sparks and produced by Nick Lowe, fared slightly better by reaching number 34. At the start of 1978 they teamed up with Richard Gottehrer who had been a member of the US garage band The Strangeloves and who went on to write songs like I Want Candy, My Boyfriend’s Back and Hang On Sloopy. As a producer he worked with Blondie and Joan Armatrading and then Dr Feelgood. New on the scene at the time was a Sussex-born songwriter and guitarist called Mickey Jupp who moved to Essex and became synonymous with a number of Essex bands. Jupp had written a song called Down at the Doctors which he recorded himself but it sunk without trace. He then became very involved in the pub rock scene and gave the track to Lee Brilleaux. Lee did not like the song at first, but decided to keep it in their live shows before recording it. The song, which is an invitation from the doctor to feel good all night long, was eventually recorded but Jupp was not keen on the Feelgood’s version. It featured the typical Feelgood guitar solo and a harmonica solo performed by Brilleaux. There is a line in the song which goes, ‘I just want to shoot some rhythm and blues in your arm but the BBC refused to play it so the line was re-record as ‘I just want to stick some rock and roll in your arm which was obviously so much better and made all the difference! At the end of the guitar solo, you can hear Lee shout the words, “Eight bars of piano,” which was an instruction to the engineer to dub in the keyboard at some point in the future. For some reason that piano solo never got recorded but Lee’s request was never erased from the original single. Their next hit was their biggest and it was the Nick Lowe co-written Milk and Alcohol which made the top 10. The follow-up to that was the number 40 peak of As Long As The Price Is Right. Because Jupp hadn’t liked their version of Down at the Doctors, the band offered to re-record it which they did and the new version appeared on the B-side of As Long As The Price Is Right which Jupp was keener on. Down at the Doctors did feature a few times at the end of the BBC Comedy Show Not the Nine O Clock News. By 1982, all the original members had left the band with the exception of Brilleaux who drafted in various musicians, but the band came to an abrupt halt in April 1994 when Brilleaux died of cancer. Brilleaux had insisted, prior to his demise, that the band should continue after he’d gone and so they reunited in May 1995 with John Gage on lead vocals and every year since Brilleaux’s death there has been a special concert held on Canvey Island. It’s known as the Lee Brilleaux Birthday Memorial and generally features current and former member of the band who come and celebrate the music of Dr Feelgood, and, additionally, it raises money for The Fair Havens Hospice in Westcliff-on-Sea. In 2014, The Feelgood’s performed a non-acoustic set on the acoustic stage at Glastonbury.